Gluten free eating just got budget-friendly with Somey’s Kitchen range of chapatis and pooris, now available at online and offline stores in the city. Somey Samuel, a Bangalore local, fell in love with cooking at the age of nine. She nurtured her passions and her family and friends say that her cooking only got better with age! To showcase her mother’s extraordinary skills, Somey’s daughter – Sandy Samuel Jerome and her son-in-law, Joel Jerome – started Somey’s Kitchen. 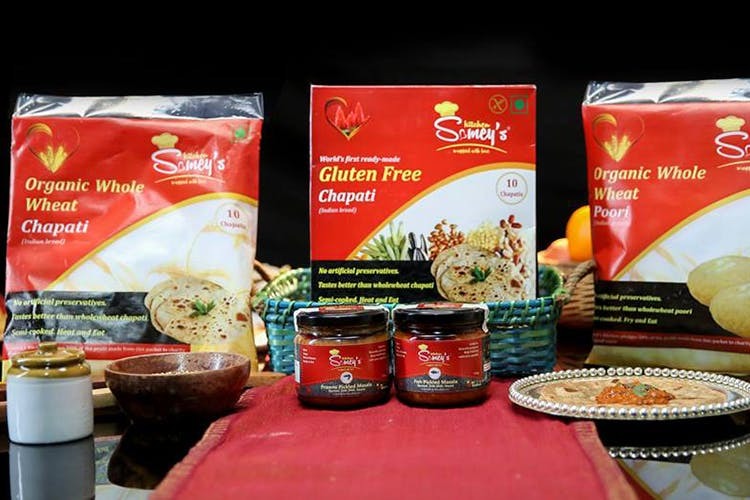 Based out of London, with production and operations in India, Somey’s Kitchen has now launched gluten free chapatis and pooris. The brand says that both these semi-cooked products are preservative free and made using all-natural ingredients. And while gluten-free products can usually burn a hole in your pocket, Somey’s retails its chapatis for INR 130 per packet and the pooris at INR 115. You can pick up packets at Star Bazaar, Nature’s Basket and Big Bazaar or order online from Big Basket. The foundation of Somey’s Kitchen is its lineup of delectable, non-vegetarian pickles that have been made using Somey’s time-tested recipes. For now, you can get Prawn Pickle Masala or a Chicken version. But the company plans to add okra, brinjal, and potatoes and peas to that list. They are also looking to launch bhaturas and curry pastes in the near future.